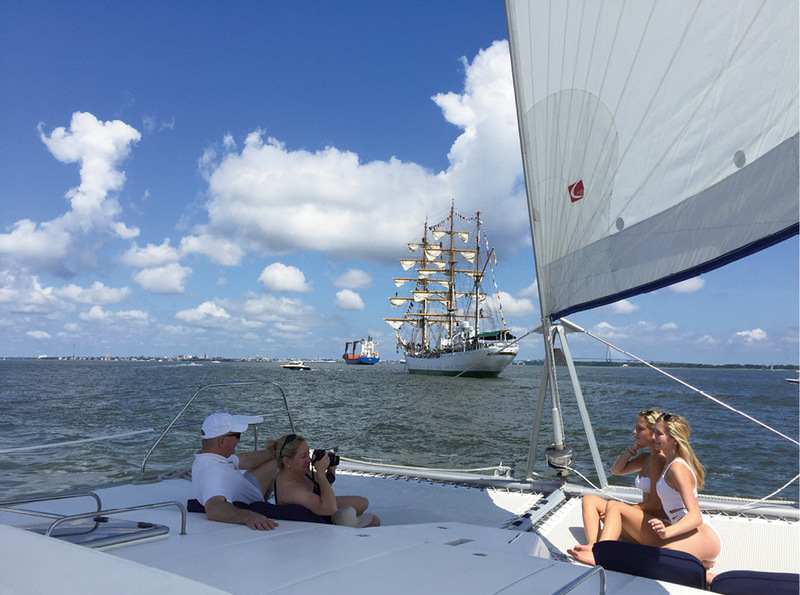 Cruise Charleston Harbor aboard a private charter with Om Sailing. 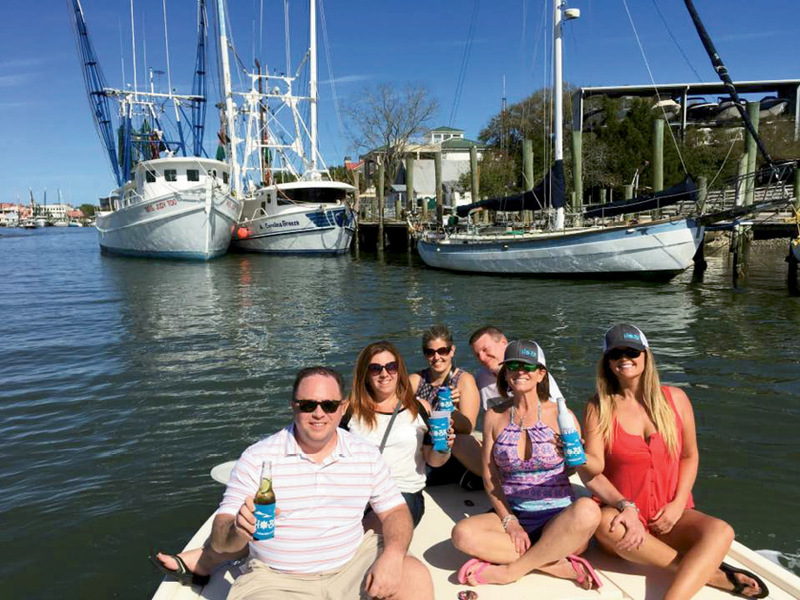 Paddle from Shem Creek through the harbor and around Crab Bank on Nature Adventures Outfitters’ two-hour, half-day, or full-day tours. No boat? No problem. Grab your mates and use the HOBA app to hit local waterways. Cool tip: For a preview of the winged wonders on Crab Bank, visit coastal conservationleague.org/pelicam, which relays live video feed of the sandbar’s nesting brown pelicans via a pair of solar-powered cameras. For a fast, stable sail without the heeling and rolling of a monohull, step aboard a catamaran. The 27-foot Prevailaing Winds from Charleston Sailing Adventures [www.charlestonsailingadventures.com, (843) 277-9019] departs from the Maritime Center for daytime, sunset, and moonlight sails into Charleston Harbor, during which you can observe the city’s historic landmarks from a fresh perspective, as well as catch sight of dolphin pods and sea birds. For harbor and ocean cruising with a bit more sprawl, Om Sailing Charters [omsailingcharters.com, (843) 209-5280] out of Charleston Harbor Resort & Marina provides a 43-foot vessel complete with a covered cockpit and interior cabin. U.S. Coast Guard-licensed captains pilot both boats. Or dip into the Stono River on board Charleston Trimaran’s ocean-ready, 37-foot, three-hulled craft [www.charlestontrimaran.com, (843) 597-3388]. Cool tip: Venture out onto the boat’s trampoline while underway—the netting allows you to watch the water rushing below as you cruise across the surface. Centuries-old practice meets modern sport in this conflux of breath, balance, and board. 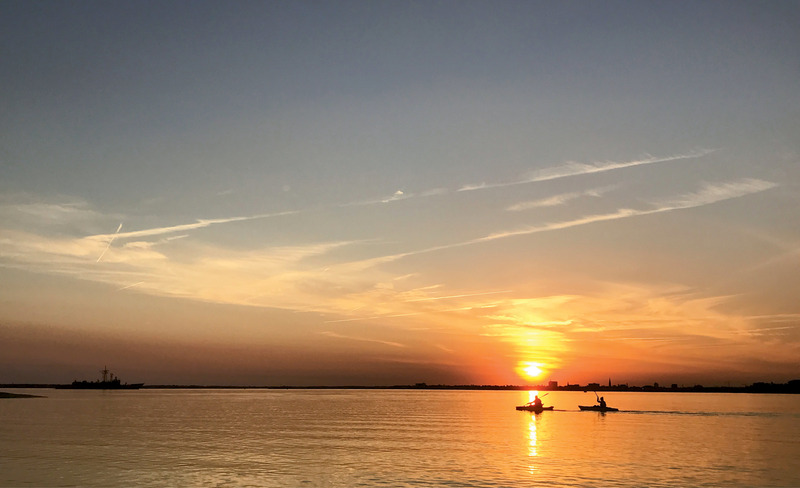 The Lowcountry is awash with floating studios where tenderfeet and gurus come together to practice yoga atop an anchored paddleboard. Most sessions open with an on-the-ground lesson in SUP fundamentals before guiding participants on a short paddle out to an aquatic classroom for a vinyasa flow. And with the open sky above and the gentle ripple of the water below, the concluding savasana promises a peacefulness unlike anything you might experience inside a gym. Cool tip: Yoga atop a paddleboard may seem wildly unattainable, but you don’t have to be experienced in yoga or SUPing to participate. The instructors will provide options for every level, and the risk of falling in mainly comes into play if you want to get adventurous with your poses. Cool tip: On July 29, Charleston Paddle Club hosts its second annual Palmetto Paddle competition [palmettopaddle.com] with a three- and an eight-mile race up the Ashley River. From SUPs to sea kayaks to canoes, any paddle craft with fewer than eight people aboard can take part in the challenge. 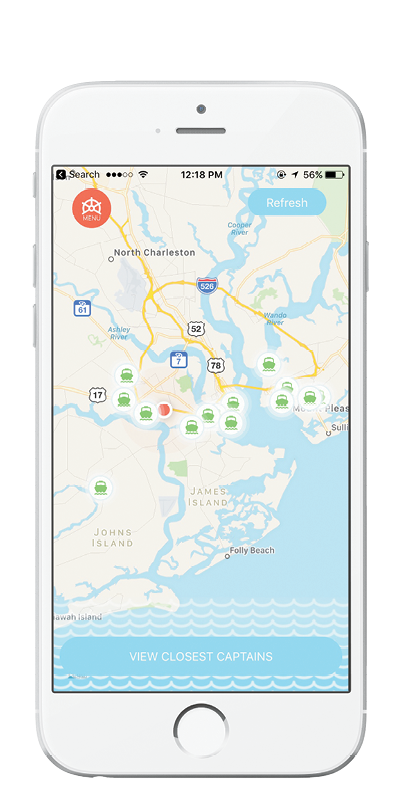 Even landlubbers can answer the call of the sea by dialing up the recently launched HOBA app, created by Charleston captain David Yates. Described as “Uber for boats,” HOBA has connected local boat owners with more than 4,000 passengers seeking on-demand water taxi, fishing, and day-cruise services. Navigate the searchable map to locate available vessels and view each one’s rates, photos, routes, and abilities. To get on board, providers must possess a charter boat captain’s license from the United States Coast Guard [www.hobarides.com].